THIS TRIP IS NOW FULL. Contact Ollie to place your name on the waiting list. 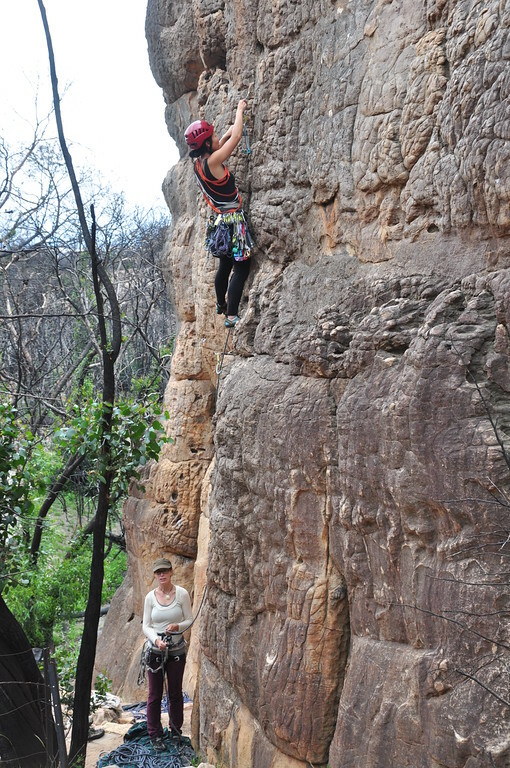 Summerday Valley is a popular climbing area of the Grampians providing a range of single pitch Beginner and Intermediate grade climbs which are protected using Trad gear. Most of the area is now open to the public after the fires, so we will have a range of areas to climb including Back Wall and Wall of Fools. Helen leading Antics* (10) at Summerday Valley. Carole belaying. Not only is the Grampians a world class climbing area, it is also home to one of Australia’s most historical and acclaimed wine regions. Since when in Rome, one must do as the Romans do, we have organised this trip to bring you the best of both worlds – Climbing and Wine. Some experts even believe that the antioxidants in wine help you to live longer and climb harder! To enjoy the best of both the wine and the cheese, we will be staying at the Mt Zero Log Cabins. Leave some room after dinner, bring some cheese and wine and join us for a Saturday night social gathering. There is no better way to relax after a full day of climbing than to chill out by the campfire with some well earned cheese and wine. Accommodation: Mt Zero Lodge – $27 per person per night for a 6 person share cabin. The Trip Leaders for this climbing and social extravaganza are Ollie Sherlock and Helen McFadzean. Please contact Ollie prior to the trip to secure your place. Full payment for the accommodation will be required to secure your place on this trip. Places on this trip are limited. Beginner places may also be limited.